When Kaumudi Marathé moved to the US from India, she never thought she’d be a famous chef, food writer and unofficial spokesperson for Indian cuisine abroad. Shared Tables is her memoir of an unlikely career enriched and shaped by family history, stories, memorable meals and staunch friendships. In this book, Kaumudi explores her roots in the Konkanastha and Saraswat clans, recalling her immersion in their classic Marathi cuisines. Her peripatetic childhood, spent in places as diverse as Poona, Canada, Nagaland, Hyderabad and Wales, let her taste and savour the many flavours that came her way. As an adult, her choice of journalism as a profession took her to the Bombay of the heady 1980s and ’90s, where she met the challenges of adulthood and authorship, navigating marriage and deadlines, while constantly exploring the many offerings of the city. Her eventual move to LA, a city that encouraged her to dream of an entirely new way of living, enabled her to set up the first Indian cooking school in the US, Un-Curry, alongside her restaurant and catering company. Throughout her journey, Kaumudi shared tables with a variety of friends and family, all of them laughing and eating together and helping one another grow into their present selves. Via anecdotes, recipes and photographs, Kaumudi Marathé illustrates how love and food build a shared connection amongst diverse cultures, countries, backgrounds and professions. 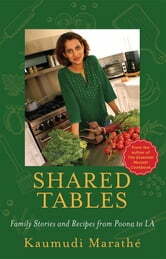 Shared Tables is a feast for the mind, heart and soul.